This is my interpretation of the nicoise salad and it just happens to be vegan. The vinaigrette was so light and flavorful making this an incredibly tasty lunch or satisfying dinner. The inspiration came from some gorgeous nicoise olives that recently found their way into my refrigerator. Lucky me!! If you have capers in the house I highly recommend garnishing with a few, or a bunch if you are so inclined. Bon Appétit! First, make the dressing by combining green onion, lemon juice, evoo, vinegar, and s&p to a small mixing bowl. Combine thoroughly, cover, and place in refrigerator until time to use. In a medium size sauce pan, over high heat bring some water to a boil - enough to cover potatoes. Once boiling add potatoes and cook until fork tender. Remove potatoes from water, but do not drain. Add green beans to boiling water and cook for 3-4 minutes. Drain beans and rinse with cold water immediately to stop the browning, and continued cooking of the beans. Cube potatoes and spoon a bit of salad dressing over the top. Dress the beans as well, and set aside. Preheat oven temperature to 500°. While the oven is heating divide the dough into two portions, shape your dough into the desired shape, adding as little flour as possible. Poke several small holes in the crust with a fork to prevent bubbling. Transfer pizza dough to whatever, pan, stone, etc you will be using for cooking. Brush crust with a bit of extra-virgin olive oil, and cook for about 7 minutes. While dough is cooking chop spinach and tomatoes and dress with the balance of the dressing. 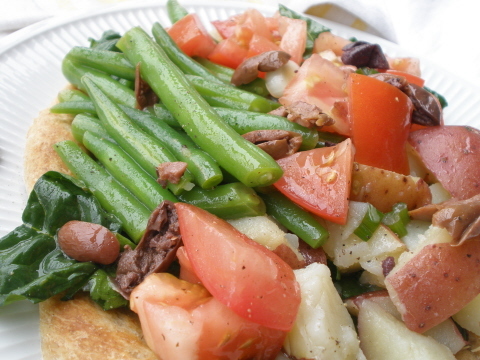 Once the dough is cooked, layer spinach, potatoes, green beans, tomatoes, and olives in desired arrangement.